This entry was posted in Slashfood Archives on October 12, 2009 by Kat Kinsman. 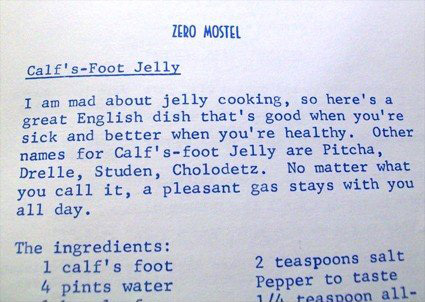 It would seem that Zero Mostel was a sucker for foot jelly — a veritable fiddler on the hoof. And it must be said that there’s a tremendous visceral appeal in having a trotter all a-bubble on the stovetop for the better part of a day. For goodness sakes, many a savory pie or festive aspic demands it, and heaven forfend that boeuf go sans gelée. This entry was posted in Authors on October 6, 2009 by Kat Kinsman.